Tata Communications, a leading global digital infrastructure provider, is working with Hong Kong based start-up Doki Technologies to support the company’s expansion in the US and Canada, Europe, and Southeast Asia. The recently unveiled dokiWatch S will come with a Tata Communications MOVE™ SIM built in. So, when a parent or child switches on the dokiWatch S for the first time, the smartwatch is instantly connected to the Internet, anywhere in the world. The dokiWatch S is the world’s first wearable phone and smart locator that combines video calling, voice calling, messaging and location-tracking capabilities in one simple device. All these data-enabled features of the smartwatch are powered by global 3G and 4G connectivity provided by the Tata Communications MOVE™ platform. 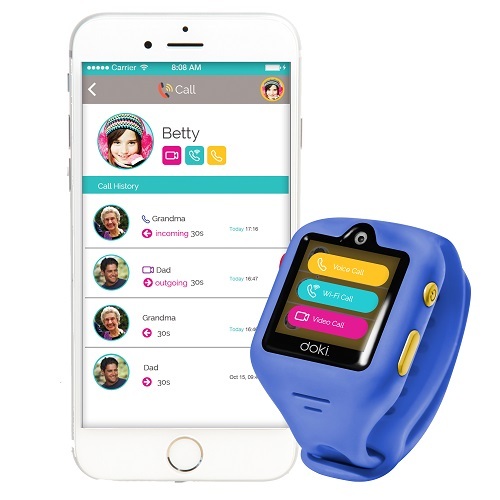 dokiWatch S – with instant, secure connectivity worldwide provided by Tata Communications MOVE™ – enables parents to keep track of and communicate with their children. Tata Communications MOVE™ harnesses the company’s relationships with more than 600 mobile network operators (MNO) around the world, eliminating the need for Doki Technologies to negotiate separate data connectivity agreements with different local MNOs in each country. This helps accelerate the company’s international expansion, as it looks to sell 200,000 smartwatches worldwide in 2018 – up by 40% from 2017. Technavio has identified Doki Technologies as one of the key players in the global children’s smartwatch market, which the analyst firm expects to expand steadily at a CAGR of almost 16% between 2017 and 2021. The API-enabled, fully-automated Tata Communications MOVE™ platform is integrated with Doki Technologies’ business processes. This enables Doki Technologies to spot trends in the data consumption of dokiWatch S devices globally, adjust tariffs easily, and enhance billing accuracy. The software-defined platform also allows the company to customise the features of dokiWatch S with children’s needs in mind. The Tata Communications MOVE™ platform is part of the company’s aim of creating truly global, borderless mobile experiences for people and things. It is underpinned by Tata Communications’ global network, which today connects 4 out of 5 mobile subscribers and carries over 25% of the world’s Internet routes. Tata Communications will be at Mobile World Congress in Shanghai on June 27th-29th 2018. Come see us in Hall N4, Stand N4.EMRF01. Doki Technologies is a Hong Kong based technology start-up focused on creating smart IoT devices for children. We’re a passionate team of dedicated individuals who are experts in our fields, with one common goal – to develop innovative smart devices that help transform the way families stay connected.